Daisy's Gift is the story of a donkey who because she was different was unwanted by people and made fun of by all the other donkeys. Until one day everything changes. . . . NOTE: I wrote this to be a story for children however I believe it could be enjoyed by everyone. It was a warm night when Rosie gave birth to her baby girl whom the Caregiver had called Daisy. The Caregiver being a gentle and patient man smiled and waited for the Daisy to stand on her legs and she tried with all her might but she couldn't stand on them so she pushed and pulled and still she couldn't stand. Finally, frustrated beyond compare, she cried and her mother Rosie was there immediatley and so was the Caregiver after having waited and watched noticing to his dismay that this little girl had a very big problem. 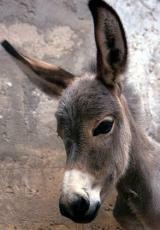 Her legs were much shorter than other donkeys and her belly was round and chubby to the point that she couldn't stand. The Caregiver sighed "Oh girl, she wont be much use than a ride for small children and that is if she stands, I'm sorry Rosie." Rosie snorted highly insulted for Daisy was perfect if only to Rosie herself then turning to Daisy she nuzzled her and whispered softly, "Don't worry my beautiful Daisy after all the Great Creator has a purpose for us all both great and small." Her mother's voice soothed her and dried her tears. "One day my Daisy you will stand, maybe not right away but someday." her mother encouraged her and strengthened her. She was not going to lose faith.. .
Years had past and Daisy grew and though she could stand she was slow in walking and not able to run still she wanted to play with the other donkeys her age but to poor Daisy the other baby Donkeys were most cruel and made fun of her. Dash the brown donkey wanted to play pounce the flowers which involved running and jumping into a patch of flowers. Daisy tried to run but her little legs got caught from being so short and she fell hard flipping over and landing on her back. "OUCH!" she cried "that hurt" when she was recovering the other baby Donkeys gathered around her laughing and chanting. "Daisy the Lazy too stubby and chubby can't run can't jump can't do nothing the tubby wubby! ha ha ha ha" Daisy cried louder because words did hurt and sometimes they hurt worse than sticks and stones. She picked herself up and hobbled to where the parents were grazing in the far off field she found her mother and went to her. The moment Rosie saw the state her little Daisy was in she ran to her side and nuzzled her. "What's wrong my darling?" she asked her though she had a feeling of what Daisy might say.Daisy sniffled for the tears had all but run out, "I'm not good at anything, I can't play like the other donkeys." she hid her face. Rosie made Daisy look at her and spoke gently. "Daisy you listen to mama, don't you pay them any mind for the Great Creator made you special." Daisy became angry and stompped her little hoof the best she could, "Well maybe I don't want to be special! Maybe I want to run like Dash, and Jump like Princess! Maybe I want to be normal for a change!" her voice cracked as she began to cry some more. "Daisy, look at mama, you don't mean that just because we don't know the Great Creator's purpose right off doesn't mean He don't have one, His purpose will be understood in time but for right now I want you to focus on all the things you can do instead of all the things you can't. One thing you got that the other's don't is a big heart that's filled with a whole lot of love. Don't curse them instead bless them and when they make fun of you pray for them." Daisy sniffled and nodded her head, she would try. Life didn't get much easier as Daisy grew up and one by one Daisy saw the Donkeys that were a little older than her go to good homes not Daisy though instead the Caregiver led her away from the selling stalls and tied her to the circle he fashioned. Daisy looked around it had a queue and the rope that was tied to Daisy's halter allowed her to travel in a full circle but that was it, she couldn't go anywhere she wanted too. The Caregiver fashioned a few waited sacks and led her around the circle teaching her where to stop and how many times to go around, she was very smart and picked up on the routine quickly. After a few hours of the same thing the Caregiver checked her small legs and broad back making sure she could handle the weight. There had been no problems so it happened that she would be a ride for the children of potential buyers, it worked out for the Caregiver in the end. So was this the fate of Daisy? Going around in circles her whole life with no deffinate direction? No though it had been several years of the same routine. Children would come to the old merchant whom was the Caregiver just to see Daisy, to pet Daisy, to feed Daisy, and to ride Daisy. And for Daisy a job of loathing became a labour of love and though such work would be considered a joke to Donkeyfolk Daisy wasn't ashamed somtimes the pangs of sadness would creep in a little when others would make remarks about her but when she saw the children's joy all that seemed to drift a way in a distant place and she would bless them and pray for them. She would pray for herself too, in the early morning hours when the sun was just peeking out over the east toward the mountains she always looked in that direction when she spoke to the Great Creature believeving that was where the world ended and Heaven began. "Great Creator" she often cried "please don't forget about me even if this is all I'm meant to be." she felt so lonely especially at this time of day. The children of men were wonderful but she couldn't talk to them or rather they wouldn't understand her when she did speak to them, they would simply pat her on the neck and continue about their games. Sometimes it was looking for lost treasure other times it was pretending to be in egypt and Daisy was trekking them across the desert to the promised land like in the days of Moses other times it was battle and Daisy was the mighty steed to carry the little commander. She delighted in their dreams but she longed for more, was it wrong to want more? These things couldn't be said not at this time but things were brewing in Rome. . . It was on such a fateful day that would change the course of history forever when a decree came out from Rome that all would be accounted for and taxed accordingly and everyone would have to return to their hometown in order to be counted and taxed. Well of course that made the Camels really excited and one thing everyone knows who is apart of the animal kingdom is that camels being funny creatures in the essence that they act like they don't care about anything except spiiting and chewing that is until you turn around and they become the first participants in a whole ring of gossip also what the whole Animal Kingdom knows that if the camels are gossiping about it then the whole town was going to know by that afternoon and thus the gossip about Rome traveled through the town into the countryside and eventually reached the donkeys on the Caregiver's ranch. And there was excitement and happiness on the whole ranch. "Hey guys I heard from the camels that a lot of people will be needing to travel and some of them are important! Something about a tax or a place called the great Room or whatever who cares they will be needing us!!!" Jeff the black donkey with one white hoof called kicking his hind legs up in the air in excitement. "Wonderful!! I'll get to go home with a shiek it's written in the stars"Lily pranced proudly absolutely certain of herself. "A shiek! yeah right what planet are you living on Lily? Sheiks got so much money that they buy camels for hauling their stuff not donkeys, or did you think a shiek was acutally going to ride a donkey??" Darren spoke between teeth as he gnawed on some grass as if uninterested but also making everyone gasp at the thought of what he had said. "Camels for hauling stuff? That's the most ridiculous thing I ever heard anyway where do you think this Great Room is?" Dash Jr had always been an inquisitive donkey taking more after his mother than his father who had been more interested in running and jumping back when he lived on the rance Daisy rememebered. There was much chatter still going on amongst the donkeys as they tried to figure out what the Great Room could be. "I don't know but who cares if we have to go to the Great Room then I'm the girl to get them there!" Lily declared stomping her hoof in determination. "We're not going to the Great Room Lily we're going to other places, you listen about as well as a Llama, I swear!" Dash Jr corrected which made her trot off and started a whole round of bickering and arguing until one small voice made the whole room stop in dead silence. "Maybe someone might pick me." Daisy spoke in barely a whisper more to herself than to anyone there knowing from many failed attempts that she couldn't talk to anyone there because they were all terrible. The silence however didn't last as everyone broke out in laughing and hee-hawing. "Daisy the Lazy that is too funny for words hee haw haha he haw haha" Jeff laughed and everyone joined in the age old chant. "Daisy the Lazy too stubby and chubby can't run can't jump can't do nothing the tubby wubby!!" it broke out in more laughter which made Daisy walk away as fast as she was able and cry but before she could go Lily had stopped. "Hey Daisy" Lily began in a sing song voice that made Daisy think for a moment that she might be nice to her just this once and offer her some comfort even though she could be one of the ruthless meanest donkeys when she wanted to which happened to be almost all the time. "You stick with the kids leave the real jobs to us because honestly nobody wants you and if the Great Creator wanted you He would have made you normal like everyone else" Daisy left them and cried louder she found it hard to pray for Lily especially after the pain she caused her instead she cried out in anger and despair and with a deep pain that no one there understood. "What did I do to deserve this, why don't you love me Great Creator? What did I ever do that You don't want me?" when no answer was forthcoming she thought it must be true and so she laid down and cried until there wasn't one tear left to cry believing that no one cared or heard. The Great Creator did hear Daisy's cries and gathered every single tear and kept them, the time was now and Daisy was ready for her task. She had many years of practice both with patience and with love, she was the one. Though there was some doubt her heart was good and gentle. He loved Daisy and she was made perfect and there was nothing wrong with her, the only thing wrong was the world's perception on those whom were a little bit different and the world was about to get a lesson in what true beauty was for it happened that the next day there was a ruch for Donkeys and Camels and Cattle for the long journeys the towns people would be taking, the Caregiver like always put Daisy oput to entertain the children but today there were so many the small queue that had been made could not hold them all and they lined up one after the other. As people bought every last Donkey the line diminished until one child remained, he wasn't like the other children he got up on her back and gave her a pat at first he didn't say anything. There were no games no talking they just went around in a circle of silence but it was a peaceful silence. "The Great Creator does not forget any of those he has created and He has heard you Daisy daughter of Rosie. You have a special mission that only a special Donkey can do." the boy spoke softly rubbing her mane and patting her. "I can't do anything." Daisy said mostly to herself knowing that peoplefolk couldn't understand donkey talk. "Yes you can Daisy daughter of Rosie and it will be revealed to you in time, and by the way I do love you Daisy daughter of Rosie I've never stopped loving you and of course I want you, you are a beautiful Donkey you are one of My creations." the child smiled and pointed to the ground where appeared hundreds of jars all carefully wrapped with what looked to be water. "I saved them all and now I will wipe them away." the child wiped her eyes and kissed her love filled her and healed her broken heart. The child smiled and then disappeared along witht the jars of not water but tears, her tears. It was that moment Daisy realsied she had just brushed company with the Divine. "Come on ol' Girl" Daisy walked with the Caregiver caught up in thought of what the Divine message about a special task could mean, she had been so caught up in thought that she hadn't even noticed the Caregiver had stopped and until she felt the tug of the halter. "Wait!" there was one couple left a man and his wife. "I'm sorry but I'm sold out." the Caregiver tried to explain. "Please hear me, my wife is with child and needs a Donkey for the journey decreed by Rome, everywhere is sold out. I don't have a lot of money but if you could be so kind as to let me borrow the one you have there I will find a way to pay you everything owing." Daisy looked around; now there were some things that peoplefolk just missed; things so clear that were right in front of their eyes but they just couldn't see but animalfolk just knew when they were staring at a miracle. Daisy saw a miracle standing right in front of her she could hardly contain herself and what sounded like a hee-haw and a snort was really Donkey talk for "The Lord's chosen" whispered Daisy to herself, there was no way, if she couldn't even be of any use to a farmer or merchant there was no way the Great Creator and the Lord of hosts would pick her for any mission as grand as this. But Joseph looked at Daisy and knew she was perfect. Her short legs would make it easy for Mary to get up onto her. Daisy's broad back woould make the journey a little more comfortable and easier to ride, her strong muscles and short chubby legs would make the journey safer to travel through the rocky places. She was the one. The Caregiver looked at Daisy, he had grown very fond of the little plucky Donkey. "Tell me ol' Girl what do you think?" Daisy pulled away from the Caregiver and looked onward toward the family, her heart filled with love and kindness and an eagerness to help. "Good bye then ol' Girl" the Caregiver gave her one last pat then turned to Joseph. "I will give her to you because I've got a feeling that you were the one we've been waiting for. Daisy knows good character and you are good people." the Caregiver wasn't sure why he had done it but he was glad he had given Daisy to Joseph and his family. Mary mounted her back and Daisy rode passed the old circle and toward the mountains she had always longed to explore to see what was on the otherside. She wasn't carrying a king or shiek or even a merchant but in fact the greatest task ever known to animalfolk and people folk alike it was the work of mighty war steeds but no it was she a simple Donkey short and stalky that had been chosen not steeds of kings or camels of great sheiks or cattle of wealthy merchants and farmers. And she did carry the Lord's chosen through the mountains across badlands, harshlands, through wind and rain, dry and scorching sun. This is what she had been preparing for and she was up to the task. She had reached the destination it was a small town known as Bethlehem it would happen that Joseph and Mary stayed with her in the stable she laid down to keep them warm. Shepherds had come to see the new born baby and fall down to worship him and then the wise men whom were three kings from the east had come bringing gifts it seemed like everyone was giving something and it made Daisy feel a little sad because she had not given him any gold, she had no fracensince or anything as fine as myrh. She wept silently to herself. Betty the gentle milking cow whom had been in the other stall next to Daisy and her peoplefamily bowed her head down to get a better look at Daisy whom was crying. "What's wrong honey child?" she asked in her sweet gentle voice that reminded Daisy of her mother. "I just wish I could give something too, I know it may sound selfish but I want to give a gift too only thing is I have nothing to give I don't really have anything." Daisy sniffled. Betty consoled Daisy and expained it to her, "But you did Daisy baby, you gave both mother and child a comfortable and safe ride through some of the harshest land known to animalfolk. You gave them your hey and trough for a cradle, you laid down to keep them warm and most importantly you did all these things out of love. The Great Creator made you special so you could do all these things for them. That was your gift Daisy, without you they wouldn't have made it this far you were apart of the grand plan." It was then that Daisy realised how right Betty's words were and how right her mother Rosie's had been she smiled and said "Gosh I guess I did didn't I" and after that Daisy never felt bad about the way God had made her and to all the animal folk, Daisy was remembered not as the short and chubby Donkey but as te Gentle Donkey whom Carried the Lord's chosen through harsh lands. She carried mother and child even from Bethlehem to Egypt fleeing from the wrath of Harod. This was the story of Daisy and her gift. God makes us all different for many different purposes, No matter how different we may seem to each other we should remember God loves us all and we should be kind to one another. © Copyright 2019 Kathryn Grace. All rights reserved. Go God! =^.^= No, but seriously, I liked it. Very well done.